Flying Eye Books, 9781909263666, 32pp. A simple, stylishly illustrated picture book […] This appealing book makes the timely decision to hold the conversation about male emotions while everyone involved is in costume, performing some iconically macho role. With minimal text and a dozen illustrations, [Keith Negley] speaks volumes about how even the biggest and strongest men get sad sometimes and cry. […] this book is a great way to have your child talk about feelings, and recognize their universality. Bold and graphic, Negley’s gorgeous picture book gives kids the opportunity to reflect on the normalcy of emotions, giving little readers (and their parents) the chance to take heart —having feelings, even sad ones, doesn’t mean you aren’t as brave or tough as a superhero. This is without doubt, the perfect book to get children to open up about their feelings and emotions. [...] With bold and bright images this will appeal to any audience, but it will undoubtedly catch the eye of a younger age group. 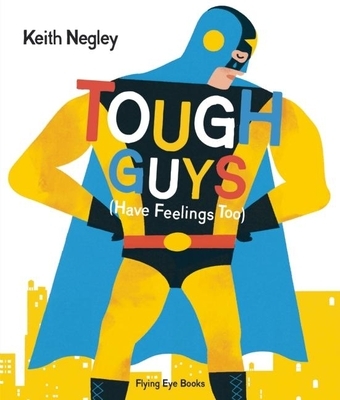 [Tough Guys Have Feelings Too] teaches little boys that they don’t have to feel like Superman all the time. [...] this book may actually go a long way towards dismantling rigid gender roles. For both men and women, crying can be considered a sign of weakness or hysteria — forcing them to repress this very natural emotional response. But Tough Guys (Have Feelings Too) wants to put an end to that right now. This is the crying revolution, and it looks like the next generation might actually grow up knowing it’s OK to have a good cry when you need. A touching reminder to your boy that it's okay to express himself, and will ensure he doesn't laugh in your face again the next time he finds you hiding in the bathroom sobbing into the mirror that this whole parenting thing is all just too much. I love how this book with its short, but poignant text gives us a chance to empathize with grown men who are seldom shown crying. […] Overall, I think Tough Guys is a winner! It’s a wonderful, simple and highly emotive book that allows little readers to explore feelings and emotions while addressing the macho male stereotype "real men don’t cry." A must-have for your child’s home library collection. [Tough Guys Have Feelings Too] goes a long way in establishing the validity of a range of male emotions—and the acceptability of displaying such emotions in public.